First up was the familiar, well for me at least, not so much for my son who’s been the visiting whanau. Our destination was Al Musmak, the old fort beside Diera Souk that overlooks Riyadh’s infamous Chop Chop Square. Historically the fort's important because it represents the creation of Saudi Arabia. 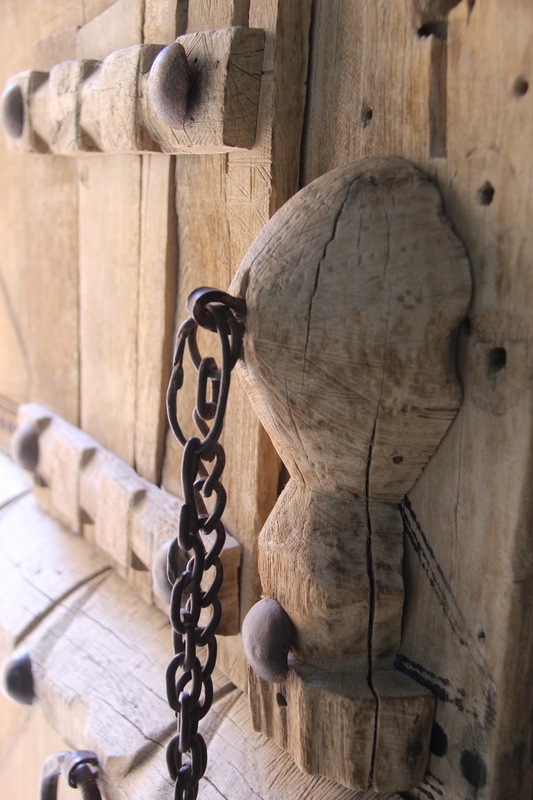 In 1902 the young Abdul Aziz bin Abdul Rahman Al Saud returned from exile in Kuwait and in a fierce and heroic battle reclaimed the fort from the occupying rival Al Rashid family. It's just outside the fort's entry gate that the battle took place. This gate is a very imposing 3.6 by 2.7 metres and as we walked through I pointed out to my son the spear tip embedded in the door, thrown by one of Al Saud's men. 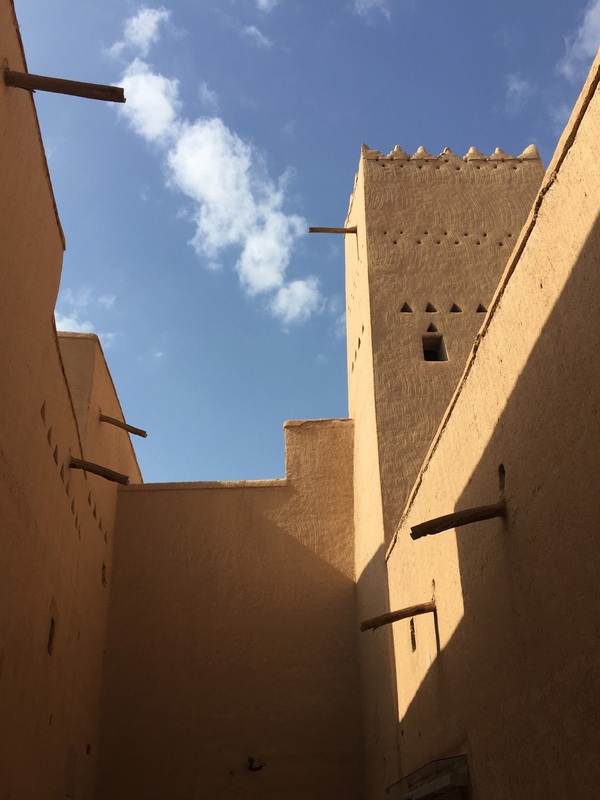 The fort's a traditional Najd mud brick construction with four conical towers and very thick walls. The walls are a deliberate design feature, they keep the fort cool in summer and warm in winter. The tall ceilings allow the hot air to rise to where small windows pull the air out. Inside we stopped by the Diwan, the King’s sitting room. 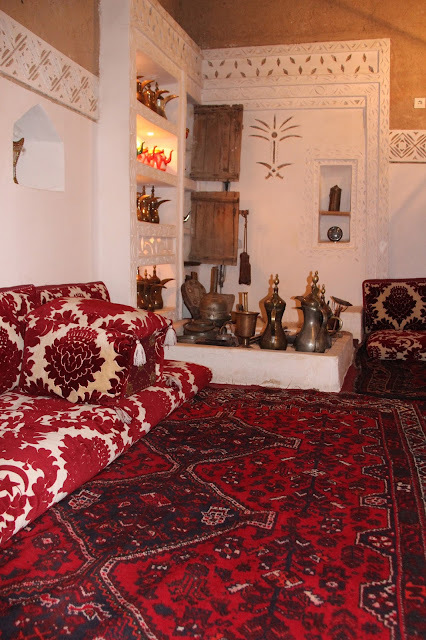 This is a large rectangular room with traditional seating. It was here that we were greeted by two impeccably dressed Saudi gentlemen in traditional white thobes and red guthra. “Are you part of the visiting Finnish delegation?” they asked. I looked at my son’s black hair and tanned olive complexion and smiled. “No,” I said and then explained that we were not Finnish but rather New Zealanders: I was living here and my son visiting. It was quiet and pleasantly cool as we wandered through the labyrinth of rooms and passage ways. 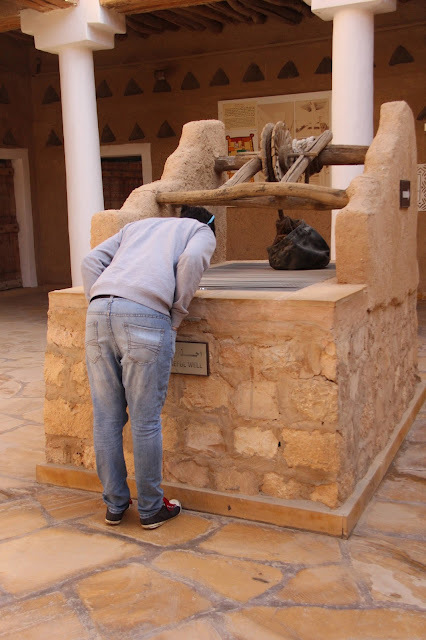 Al Musmak’s as much museum as fort, and we constantly stopped to take in both the displays and the architecture. I liked the sparse geometric designs along walls, the pattern of shadows across stone floors, and the old wooden doors, each one different. We stopped for a photo beside the Be Careful Well. “How could you not with a name like that,” my son said to me, smiling. I discovered a photo of Gertrude Bell taken in 1916 with King Abdul Aziz and Sir Percy Cox. 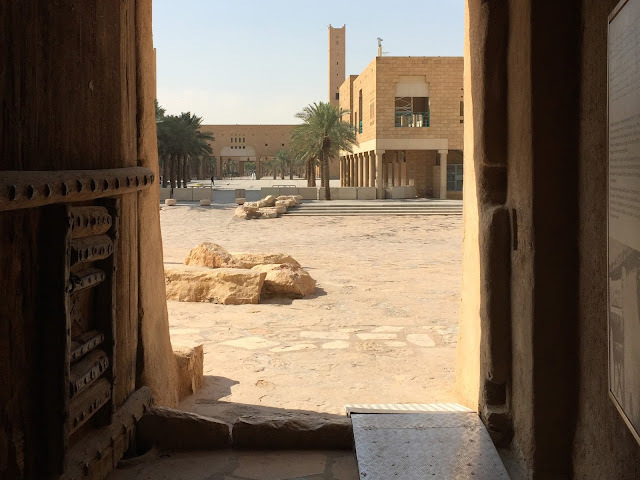 We saw photos of Riyadh in the late nineteen forties when it was little more than a large village, all mud streets and ramshackle dwellings. So many changes and so much progress in such a short time. Engrossed in conversation, we stopped by the Diwan on our way out for one last glance. One of the men who’d greeted us earlier came over. It seemed the Finnish delegation had still not arrived. “You can go in,” he said pushing the cordon preventing tourist access, to one side. We smiled and entered cautiously, wishing to make the most of the experience but not wanting to overstep his generosity. 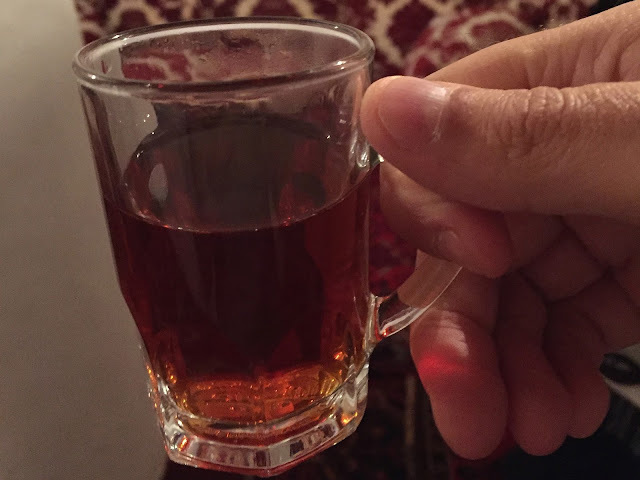 However the hospitality continued, with Arabic tea arriving and being served as we reclined comfortably. “Just wait, “ I said to my son, “there’ll be dates coming next.” We accepted the first cup and a second. However when the third arrived we politely declined, knowing, as we walked back to our bus, that we had an hour long trip ahead of us back to our compound, and in this country, comfort stops were not an option.